Exciting news from IBM Research today. The researchers there unveiled a new generation of experimental computer chips today that are designed to emulate the brain’s abilities for perception, action and cognition. 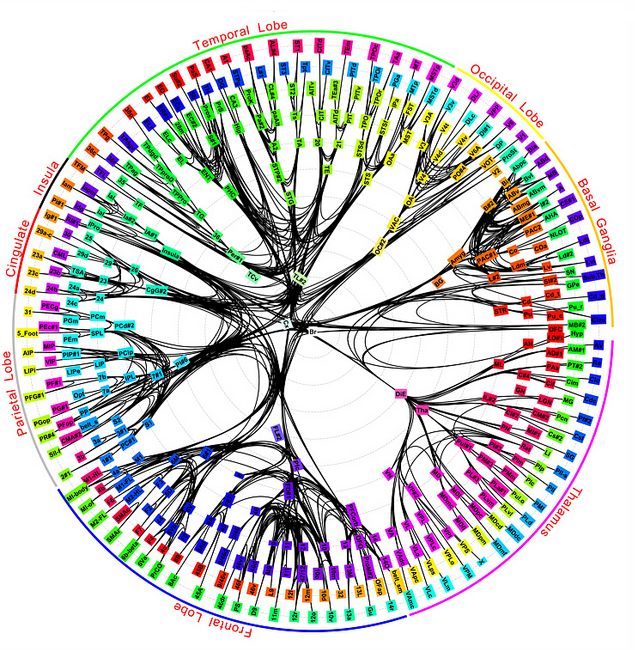 This image provides a map of the brain's network connections, which the new IBM SyNAPSE processors are looking to emulate. Such a technology could yield many orders of magnitude less power consumption and space than is used in today’s computers. This breakthrough is a sharp departure from more traditional concepts in designing and building computers. These first neurosynaptic (say that three times quickly) computing chips recreate the phenomena between spiking neurons and synapses in biological systems, such as the brain (well, most brains), through advanced algorithms and silicon circuitry. The first two prototype chips have already been fabricated and are currently undergoing testing (no Frankenstein jokes, please). Called “cognitive computers,” systems built with these chips won’t be programmed the same way traditional computers are today. Rather, cognitive computers are expected to learn through experiences, find correlations, create hypotheses, and remember — and learn from — the outcomes, mimicking the brains structural and synaptic plasticity. To do this, IBM is combining principles from nanoscience, neuroscience and supercomputing as part of a multi-year cognitive computing system. The goal of SyNAPSE is to create a system that not only analyzes complex information from multiple sensory modalities at once, but also dynamically rewires itself as it interacts with its environment –- all while rivaling the brain’s compact size and low power usage. IBM has two working prototype designs. Both cores were fabricated in 45 nm SOI-CMOS and contain 256 neurons. One core contains 262,144 programmable synapses and the other contains 65,536 learning synapses. The IBM team has successfully demonstrated simple applications like navigation, machine vision, pattern recognition, associative memory and classification. IBM’s overarching cognitive computing architecture is an on-chip network of light-weight cores, creating a single integrated system of hardware and software. This architecture represents a critical shift away from traditional von Neumann computing to a potentially more power-efficient architecture that has no set programming, integrates memory with processor, and mimics the brain’s event-driven, distributed and parallel processing. Similarly, a grocer stocking shelves could use an instrumented glove that monitors sights, smells, texture and temperature to flag bad or contaminated produce. Making sense of real-time input flowing at an ever-dizzying rate would be a Herculean task for today’s computers, but would be natural for a brain-inspired system. IBM has a rich history in the area of artificial intelligence research going all the way back to 1956 when IBM performed the world’s first large-scale large-scale (512 neuron) cortical simulation. Most recently, IBM Research scientists created Watson, an analytical computing system that specializes in understanding natural human language and provides specific answers to complex questions at rapid speeds. Watson represents a tremendous breakthrough in computers understanding natural language, “real language” that is not specially designed or encoded just for computers, but language that humans use to naturally capture and communicate knowledge.